In pipe jacking operations, the microtunnelling machine will excavate a diameter slightly larger than the pipes. However, the ground outside has a tendency to slump onto the pipes, thus causing friction and increasing jacking forces. For this reason lubricant is often injected around the outside of the pipes. Various natural and synthetic materials may be used, as required by the ground conditions, but bentonite and polymer lubricants are some of the most common. The lubricant is supplied in powder form. It is mixed in a mixing tank, stored in an agitated storage tank,then pumped into the tunnel, along a hose which goes up to the microtunnelling machine. Here, lubricant is injected around the outside diameter of the leading pipe. In addition various take-off points in the lubricant feed pipe may also be used to inject lubricant through ports in the walls of the jacking pipes. The number of ports could vary between zero and three ports per pipe. 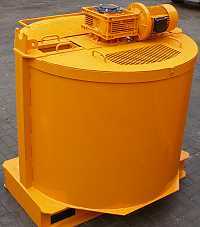 We supply a range of lubrication equipment in sizes appropriate to the jacking equipment used. Most of these units are supplied as a single module containing tank(s) and pump, making them simple to set up on site.